Anniversaries have a habit of sneaking up on you, don’t they? We are on the eve of November, 2018 – which means it’s nearly NaNoWriMo time again – and therefore it’s ten years tomorrow that I started writing the draft that became Into the Darkest Corner. I remember talking about it at work, probably on this very day ten years ago. I was working with Naomi, and Chris, and Max, an office off another office, just the four of us in a bank of desks. We were half a mile away from the kitchen and a fairly long way from the toilets. The canteen was upstairs, and most days we’d go and have breakfast together once we’d done all the urgent first-thing tasks. I remember giving them the vague ideas I had for a plot – a dangerous man, charming; how it felt not to be believed – and Naomi asking if she could be first corpse. I can’t remember how long it took me to write the whole of the first draft. I certainly carried on into December. I remember beginning to edit in January, and giving up again very soon after. I kept coming back to Catherine’s story, changing bits and pieces. I went on a day’s creative writing course run by the local adult education service. The booked tutor didn’t turn up, so an emergency replacement was called in. She turned out to be brilliant, and encouraging. She helped me unpick one scene in particular (the one where Catherine visits Sylvia in her ground floor flat, and sits outside with her wondering who lives in the basement) and told me it was good. At a later date, I remember having lunch with family at a pub in Newmarket, and telling my cousin Michael that I’d written a book. He asked why I hadn’t sent it off to anyone. It hadn’t occurred to me to do that. I don’t know what I thought I was doing, playing at editing with no real purpose. But he asked me what I was waiting for. What I had to lose. Michael was the catalyst, if you like, the push I needed to do something about this book that seemed to have something good about it, something that still excited me, and yet still felt incomplete, stilted and poor. I’ve told the story many times (I’m sure you’ve heard it), but the genius that is Greg Mosse read my draft, and sent it to Myriad Editions for their opinion, and that was the start of the publishing adventure for me and Catherine. I remember having that first phone conversation with Vicky, who would become my editor, and her inviting me to visit the Myriad Editions office in Hove. I remember panicking so much about being able to park that I got the Park and Ride, making a journey that was actually pretty simple into something rather more complicated involving several buses. I remember the smell of books in that lovely sunny office. I remember Vicky’s ideas for making the book better: I had a whole series of letters from Wendy. They were like a Greek chorus, explaining everything that had just happened. They could be cut completely. Stuart and Catherine got together halfway through the book; it would be better, Vicky thought, if they didn’t get together until the end. At the time I couldn’t see how that would help, but the fresh perspective was so exciting I went home and revised the book completely. Every one of her suggestions made the book better! I was thrilled by it, and it only took me about two weeks to have the second draft completed and back to Vicky and Candida for their opinions. It felt a bit early to be saying that, but he was right. It was the start. I feel emotional about it now, thinking back to my school days when I so desperately wanted to be an author, not ever thinking that this could be something that might actually happen. I wrote my whole life for fun, for my own entertainment, and sometimes for other people’s, without ever thinking that I was good enough to finish a book, and edit it, and for it to be published – never mind all the other crazy, wonderful things that came later: foreign editions. Wonderful French schoolkids making me a strange pink cake and doing cover designs of my book in class. Talking about my books in the USA. Spending a morning in the ancestral home of former president James Monroe while waiting to go and speak at a library event in Lexington, VA. Talking about film rights and reading drafts of a script of my novel on a sofa at the Groucho Club. Meeting other authors whose books I have loved, pored over, treasured. Meeting other authors who had actually read my book, and liked it. Reading reviews from people who had never met me, who didn’t know me, and yet had taken the time to read my book, and then to write me a review. And then, oh then, the people who wrote to me. The emails I received from women, and sometimes men, who had read Catherine’s story and seen echoes of their own experiences. People who were safe, now, and grateful that they had been able to escape. People who were still, years later, looking over their shoulders. People who weren’t safe yet, but had found enough of a voice to write and thank me for representing them in Catherine. What an honour, to have people take the time to write to me! I treasure each one of them, you know. I think of these people often and hope they are doing okay. So a full ten years has gone past since I killed poor Naomi in that opening line, and so much else has happened. But those early days are still so vivid. Thank you for accompanying me on this journey, my friends. It’s been a wild, wild ride. Your first book was a revelation and the ones that have followed have proven that you’re the best new writer to emerge in the last decade. Keep on keeping on! Just finished The Murder of Harriet Monkton. Your talk at the Whitechapel Ideas Store was inspiring but your portrayal of Harriet’s story exceeded my expectations. 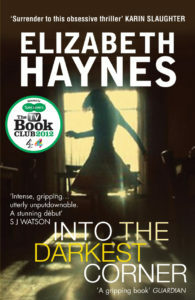 A fantastic read, unputdownable full of characterisation, social comment and psychological suspense.